I have a love-hate relationship with Sundays. Hate, because the weekend is almost over and another week is about to start before I’m ready, and love because they are reserved for lounging around, eating yummy food and giving my skin a little extra love. Pamper Sundays are a ritual I’ve come to love, and I’ve also hooked Simon on it, which was not as hard as you’d think. You know, a couple that masks together stays together. As in 98% of the cases I’ve spent the day laying around the couch in my PJs, I am obviously not wearing makeup or sunblock, so I don’t always do a double cleanse on a Sunday. Unless, of course, I’ve been out of the house. It is, however, important to wash your face before exfoliating so you can remove any dust or dirt that might have found their way to your skin. 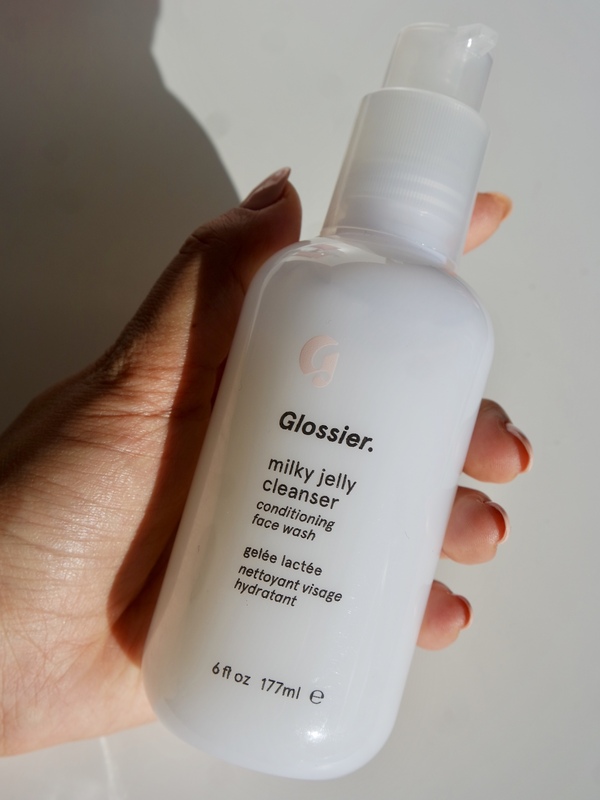 I start my routine with what I think is one of the most talked about cleansers these days – the Glossier Milky Jelly Cleanser. I may not be crazy about the rose scent, but it doesn’t bother me too much, because I love the milky jelly texture and that it makes me feel like I’ve done a good job taking the day off. 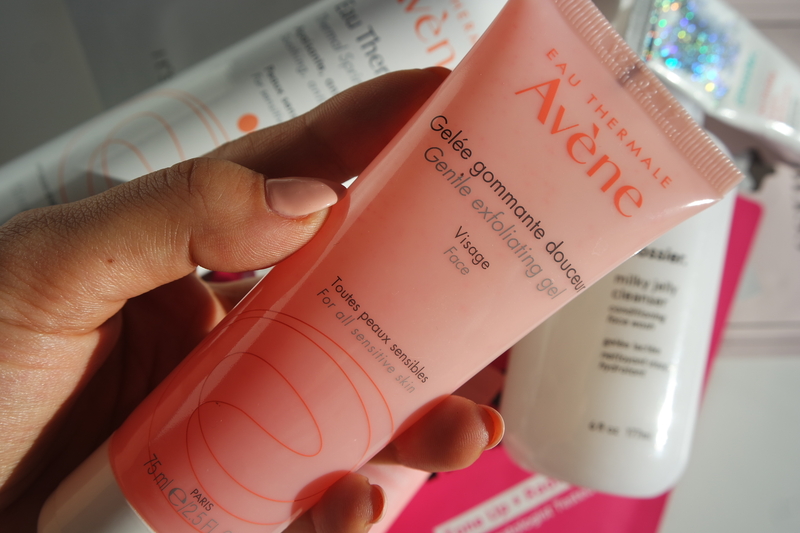 You might know that my favourite product for the job at the moment is the Avene Gentle Exfoliating Gel. I just bought a replacement because I’m obsessed with it. It comes in a gorgeous and very photogenic (!) bottle, it is indeed very gentle and does its job perfectly well. You don’t need much – pop a large pea-sized amount on your fingers and exfoliate your wet face with circular motions, without pressing too hard. Wash it all off, pat dry with a soft towel and enjoy your baby-soft skin! I do it two to three times a week, but no more, because over-scrubbing is never good. 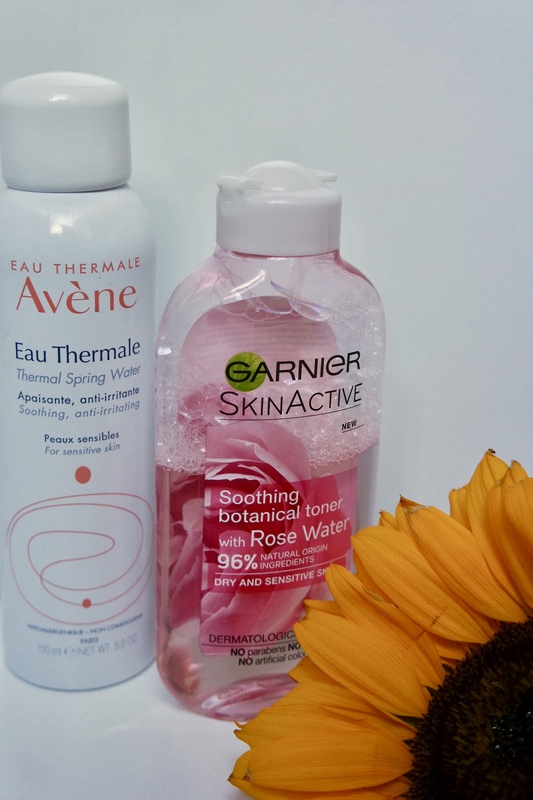 You know how much I love my Avene Thermal Water, and use it for anything and everything. After I’ve exfoliated my skin, I spray a bit of the eau thermale to make sure my skin is not irritated and slightly damp, in preparation for toner. I’ve been using the Garnier Soothing Botanical Toner for a couple of months now and what I like about it is that it feels very gentle, unlike old-school toners, and doesn’t have a harsh smell. I use a cotton pad to apply the toner all over my face, which removes any leftovers of product/dirt and make my skin ready for the next step. #facemasksunday is literally the highlight of the end of my weekends. Maybe after the occasional Sunday Roast. It’s up there, ok? I love how soft my skin feels after I’ve taken a mask on, and this is about 90% of why I do them. I’ve talked about Mask Time* in a previous post, so go check that out. They now have the Glow Starter box, which comes with four sheet masks, which makes it perfect if you’re a K-beauty or mask newbie and don’t want to commit to a big box. Recently, for example, I used the Ariul 7 Days Mask. The bamboo water in it is hydrating and works to defend your skin from signs of ageing because it’s packed with amino acids which, if applied regularly, help strengthen the skin and delay signs of ageing. Usually, you should have a mask on for 10-20 minutes, and massage the remaining product in your face and neck after removing it. 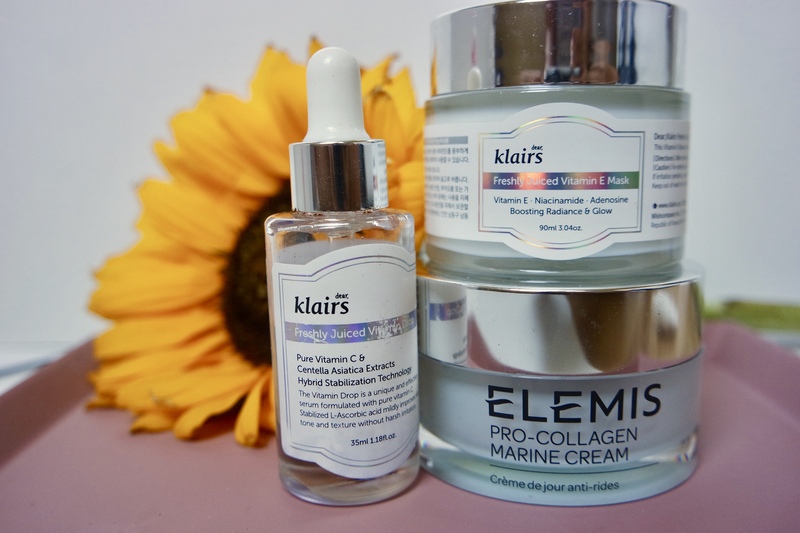 After the mask comes off and I don’t look scary anymore, I stay on the K-beauty wave and mix two dear, Klairs* products – the Vitamin C Juice Drops and the Vitamin E mask. Vitamin C is a powerful antioxidant, which brightens and smoothes the skin, fights pigmentation issues and gives the skin that we all dream of. Vitamin E is also an antioxidant, it is anti-ageing and fights UV damage, so when you combine the two, you get the power-bomb your skin needs. Teamwork! Last step, because I am still not hooked on oils, but I’m trying, OK?! Moisturisers, however, are like my favourite thing ever. Especially the Elemis Marine Cream. It is magic. I fell in love with it after using a little sample I got from somewhere and I use the full size SO carefully because I never want it to end. Now, I don’t have any signs of ageing, so I can’t say it has reduced the appearance of my non-existing wrinkles, BUT it has the most beautiful smooth formula that definitely feels hydrating and just a little boujee. And there you have it, my pamper routine. I think it’s played a big role in me getting used to going out with a bare face, and not worrying about my skin. It’s like a little plant – if you give it all the water and plant food it needs, it will grow strong (unless you’re me and you kill cacti like it’s a sport). Have a glorious Sunday! Oh my gosh have I been SO under the radar?? When did Garnier come out with a Rose Water toner? I’m adding this to my to-try list. This sounds like a terrific routine. I love that your husband likes to get involved as well. More men need to realize skin care is just as important for them as well. Have a great week! Nice haul. I have a regimen and try not to use many products. My skin is dry so anything hydrating and moisturizing for me. I use Botanics by Boots, as it’s all phytonutrients and naatural. Both day and night creams and toner. I also tone with Clean n Clear (blue one) as it keeps the spots away. I can’t miss that. I’m trying to get into the sheet mask thing but have never used K-beauty products as I hear they’re lightening. My wife loves your posts and follows them ardently. I’m sure she would appreciate your choices again. Will forward this to her. Will try and get the cleansing gel for her too. Thanks. She loves Avene stuff! Aw this is so sweet, thank you so much! Avene stuff is lovely! You sure have great products here for your facial routine;I can tell that your Sundays are so full of life since pampering is one thing I seriously do on weekends too.I’d go for your toner- since rose water is so beneficial. There are some fab products here, I definitely want to include some in my routines. Self care days are so good though. Love Avene products – they work so well! this routine is so fab to pamper yourself! 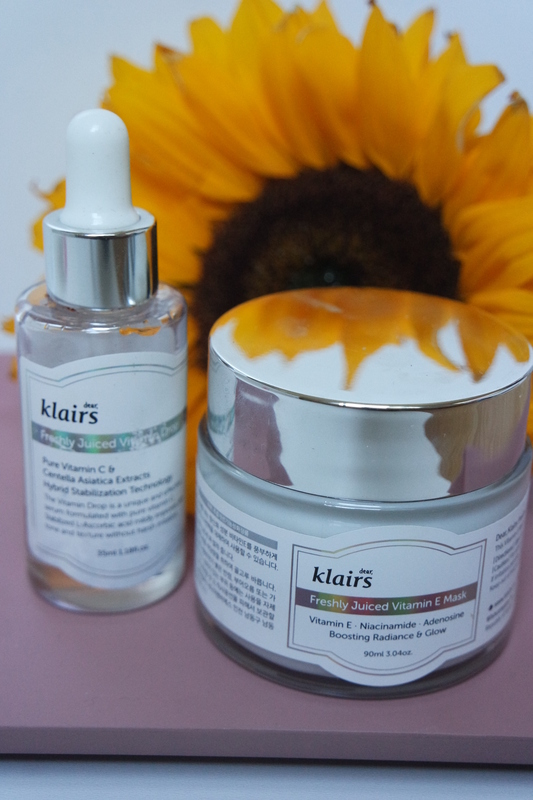 I tried the Klairs overnight mask too! I am loving these skincare products. It would be great to try them for myself. Love pampering my skin. I also love Sundays and have the same relationship with them as you. 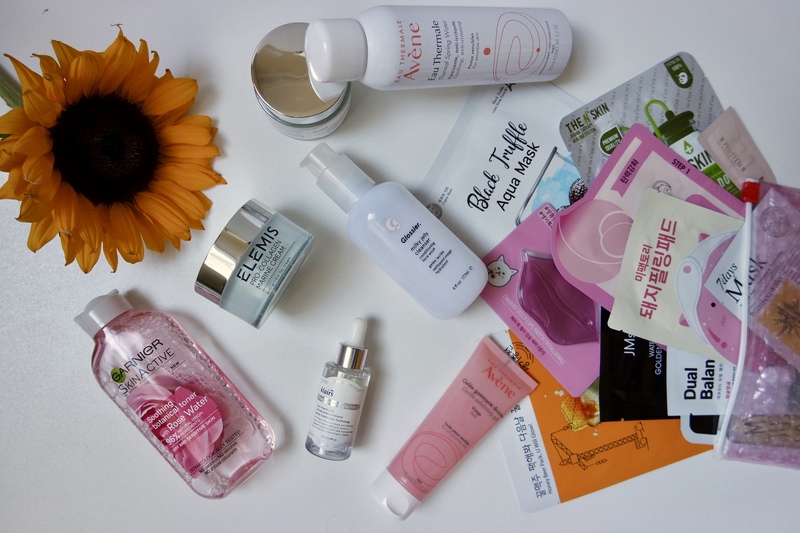 The products tht you recommend are great.